In business & in life, communication is the key tto success. And, as made clear in this book, learning to use the power of Personality Type is the key to communicating more effectively. 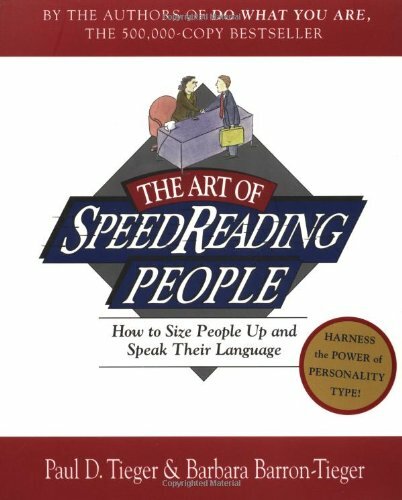 Now in the same successful format as the bestsellers Do What You Are & Nurture by Nature, The Art of Speed Reading People offers a revolutionary new tool for sizing up people & speaking their language. A salesperson pitching a customer. A manager trying to motivate an employee. A teacher attempting to make a point with a student. In any of these situations, the power to "read" another person can be a powerful advantage. Drawing on the same scientifically validated Personality Type model that many Fortune 500 companies use, this book shows how anyone can quickly identify key personality characteristics through a person's appearance, vocabulary, body language, occupation, education, & interests. The Art of SpeedReading People is the ultimate communication resource - the next best thing to having X-ray vision. If you have any questions about this product by Little Brown and Company, contact us by completing and submitting the form below. If you are looking for a specif part number, please include it with your message.